Even the skeptic who does not believe in heaven has a heaven-shaped heart. The deck is stacked and the dice are loaded, loaded with the love of heaven. Amor meus, pondus meum, said Augustine: “My love is my weight.” The gravity of his own heart pulls the sceptic in heaven’s direction, even while the antigravity of sin pulls him away. Quo vadis? Where are you going? That’s the most important question for a traveler. And we the living are all travelers. Death calls us all and moves us on. Stability is illusion. So those who cannot abide illusion must raise the question: Quo vadis? If heaven is not the answer to the question, our whole faith is false, and Jesus was a fool. If it is, then there’s nothing that is more important in the whole world. Indeed, the whole world is only heaven’s womb. Why do we hear so little about this today, even from the pulpit? Why are we told by our “leading theologians” that we must take our eyes off the clouds and keep them on the ground? 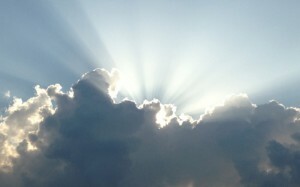 Why is it so outrageously irresponsible to think more about heaven than politics? Because these leading theologians are really following theologians, with their noses to the tail of the modern world. They are in fact upside down: not only are their eyes stuck in the mud, but their feet are kicking up in rebellion at the sky. They want to turn Christianity — which in the clear teaching of its founder was an otherworldly religion of faith, hope, and charity — into a this-worldly religion of prosperity and success (the Right with its electronic Church) or of political revolution (the left with its liberation theology). But these shams don’t satisfy for long. Prosperity is boring. The suicide rate in Sweden is something like a thousand times that of Haiti. And even revolution is finally boring. No revolution can survive its own success. Every revolution turns into a new tyranny, and Ecclesiastes’ cycles return like the clouds after a rain. The big, blazing, terrible truth about man is that he has a heaven-sized hole in his heart, and nothing else can fill it. We pass our lives trying to fill the Grand Canyon with marbles. As Augustine said: “Thou hast made us for thyself, and our hearts are restless until they rest in thee.” That’s the greatest sentence ever written outside Scripture because it tells us the secret of our destiny, our happiness — and our unhappiness, It is, however, not only unfashionable but terribly threatening. It tears the band-aid off our wound. It shows up our false gods for the tiny things they are compared with our own hearts. People do not take kindly to idol smashing. Look what they did to the prophets. But we should be encouraged. Even the skeptic who does not believe in heaven has a heaven-shaped heart. The deck is stacked and the dice are loaded, loaded with the love of heaven. Amor meus, pondus meum, said Augustine: “My love is my weight.” The gravity of his own heart pulls the sceptic in heaven’s direction, even while the antigravity of sin pulls him away. But the head must often be outwitted, for it is entangled in verbal prejudices. Talk about heaven and you’ll get sneers. But talk about a mysterious dissatisfaction with life even when things go well — especially when things go well — and you’ll get a hearing from man’s heart, even if his lips will not agree. Home — that’s what heaven is. It won’t appear strange and faraway and “supernatural”, but utterly natural. Heaven is what we were designed for. All our epics seek it: It is the “home” of Odysseus, of Aeneas, of Frodo, of E.T. Heaven is not escapist. Worldliness is escapist. Heaven is home. The pregnant woman who plans a live birth cares for her unborn baby; the woman who plans for an abortion does not. Highways that lead somewhere are well maintained; dead ends are not. So if we see life as a road to heaven, some of heaven’s own glory will reflect back onto that road, if only by anticipation: the world is charged with the grandeur of God and every event smells of eternity. But if it all goes down the drain in death, then this life is just swirls of dirty water, and however comfortable we make our wallowing in it, it remains a vanity of vanities. The existence of heaven, the desire for heaven, the nature of heaven, and the relevance of heaven are all important questions. But there is only one question that’s absolutely essential, one question compared with which how we might save the world from a nuclear holocaust is trivial: “What must I do to be saved?” When I’m honest enough to look through the door of death, infinite joy or infinite joylessness loom up as my only two possible destinies. What decides for joy? What is heaven’s entrance ticket? What is the Way, the Truth and the Life? If anyone out there is unsure of the correct answer, then for the love of God get out your Bible and study for your finals! To save you time — since you may die while reaching for your Bible — I will quote God’s scandalously simple answer to the most important question in the world, how to get to heaven: “Believe in the Lord Jesus Christ and you will be saved” (Acts 16:31).